The pet store mostly features the same cameos as last week: Dog Gundam, Lucifer, and Birdy. But over on the left, Patrick Colasour (who has cameoed in every episode of Build Divers!) is being attacked by a dog that looks an awful lot like Victory Gundam pilot Üso Ewin’s dog Flanders. The only thing is that Flanders’ ears are dark, while this dog’s ears are the same color as the rest of his coat. Of course, this pet store has Gundam-themed products. There’s some food named after Blu Duel Gundam from Gundam SEED Stargazer, and another product below it is named after the Gundam Airmaster from Gundam X. In the previous shot there’s also a box that says G Meister, likely referencing the Gundam Meisters from Gundam 00. When demonstrating the rules of the Capture the Flag match, the Gunpla shows up with life bars exactly as they appear in the PlayStation game Gundam: The Battle Master 2, released domestically as Gundam: Battle Assault. Battle Assault was released in the west soon after Wing had gotten Gundam its first major foothold in that market, and the game’s story was changed to center on Heero Yuy fighting (mostly) classic UC characters. Heero’s Wing Gundam replaced the Hamma Hamma (Gundam ZZ), and all the UC/AC characters replaced game-original characters that lacked any connection to prior continuity. Most of the “SG” mobile suits that form the Super Shock Gundam aren’t much different from their standard incarnations. The SG ν Gundam, on the other hand, is actually based on the Char’s Counterattack variation ν Gundam DFF. 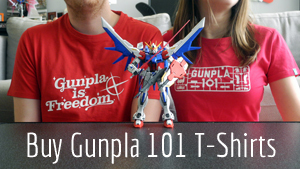 Simply put, it’s just a more symmetrical ν Gundam with double the funnels.